Our range of products include solid press on tyre and press on band tyres. Tyre Diameter 20" - 24"
We are committed to provide excellent and quality range of Solid Press On Tyre. The products offered by us are high in terms of quality and known for their easy availability. This tyre is manufactured in adherence with set industry standards using high grade rubber and advanced technology. 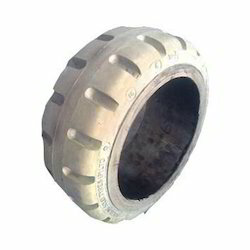 Available in different sizes, this tyre can also be customized as per the requirements of clients. Sterling's non negotiable standards of quality control ensure that whatever the application whether hot or cold, rough or uneven terrain, our Press-On tyre heads the field. We are majorly looking foreign based inquiries from Africa, Thailand, Cambodia, Philippines, Myanmar (Burma), Dubai,Saudi Arabia, Malaysia, Singapore, Europe, Uganda and Middle East countries. 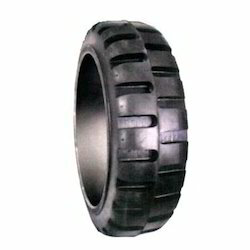 We are known for offering the quality range of Press On Band Tyres. Our products are highly qualitative and manufactured as per the specific quality norms. We assure that the customers are served in a most desirable manner with the range of their choice.